The American Registry of Radiologic Technologists (ARRT) offers the Computed Tomography exam for certification purposes. This test measures a candidate’s knowledge and comprehension of the responsibilities that staff technologists in this specialized field would generally need to do. Candidates must meet specific ethical and academic requirements before taking this test. Every test also includes 20 extra questions, which are not scored; these are pre-trial items which may be used on future exams. Candidates will not know which items are scored and which are not. The raw score (the number answered correctly) will be converted to a scaled score in a 1 to 99 range. The minimum scaled score needed to pass is 75. What imaging parameter is defined as the extent to which the x-ray helix is stretched during a helical scan, determines volume covered, and affects radiation exposure and image quality? The thickness of the slice that is actually represented on the CT image as opposed to the size selected by the collimator opening is called what? What post-processing technique utilizes thin slices and overlapping helically acquired image data to reformat cross sectional anatomy to anatomical surface renderings? What is the field of view that covers the area within the gantry from which the raw data is acquired? What post-processed image adjustment to the final displayed image determines the range of CT numbers that occupy the full gray scale? Which window center and window width would best display a lung window at the viewing console? What method or type of contrast administration may occur if the distal colon is not properly opacified with timed oral contrast agents for a Pelvic CT exam? A dilated non-opacified appendix with soft tissue stranding commonly represents what diagnosis? When the scan plane is perpendicular to the subtalar joint and the gantry is tilted towards the patient at around 25 degrees, what is the directly acquired imaging plane? What is the optimal scan slice thickness when imaging all musculoskeletal anatomy? A: Pitch is the distance in millimeters the table moves during one rotation of the x-ray tube divided by the slice thickness for single-row detectors. For MDCT, pitch equals the distance in millimeters the table moves during one rotation of the x-ray tube divided by the total slice volume or the thickness of a single slice. Pitch affects how quickly we can scan a large distance of anatomy. Increasing Pitch provides more anatomical coverage in less time, rapid coverage for CTAs, faster scanning times for trauma patients, and decreases the radiation dose. Decreasing Pitch will minimize noise, improve resolution, and increase patient radiation dose. It is considered one of the most important parameters in helical scanning. C: Effective slice thickness is the thickness of the slice that is actually represented on the CT image. It is not the slice thickness selected by the collimator opening. In axial scanning, the selected slice thickness is equal to the effective slice thickness. In helical scanning, the effective slice thickness is usually wider than the selected slice thickness due to interpolation. D: Post-processing allows the technologist to gain additional information from the patient’s study without keeping the patient or using more radiation. 3D reformatting utilizes thin slices and overlapping helically acquired image data to outline the outside of a structure. It includes only information from the surface of an object. There are many applications for 3D rendering depending on the equipment. A: SFOV is the millimeters of anatomy over which the projection data is collected. It determines the area that data will be collected. It also determines the number of detectors collecting information. A cross section of a patient’s anatomy should be completely contained within the SFOV. The CT numbers may be misrepresented on the final image if anatomy within the imaged slice is outside the SFOV. B: Windowing adjusts the brightness and contrast of these gray shades to optimize image quality. There are two window settings to adjust, window level and window width. Window width determines the range of CT numbers that occupy the full gray scale on the image monitor. Only the CT numbers within the specified range will be evenly distributed across the gray scale. The gray scale goes from black to bright white. Increasing the window width allows a larger range of CT numbers to be viewed within the gray scale. It will also make the image appear to have less contrast between tissues with similar CT numbers. B: Windowing the CT image to a diagnostically relevant range of CT values is accomplished by choosing the center and the width of the window. Lung tissue is best displayed with a center around -600 and width around 1700. C: Rectal contrast is utilized to visualize the distal colon in male and female Pelvic CT exams. It also helps to differentiate the colon from other pelvic anatomy. Rectal contrast is often used when a rectal pathology is suspected or a patient cannot tolerate the oral prep. A: Acute Appendicitis can often be diagnosed when the CT images display a dilated and non-contrast opacified appendix. There may also be soft tissue stranding or inflammation around the adjacent tissues. Sometimes an appendicolith may also be present. A: To obtain a direct oblique coronal plane on foot/ankle CT exams, the patient should be positioned with knees bent and feet flat on the scan table. The gantry is angled 20-30 degrees perpendicular to the subtalar joint. This will acquire the scan data in a direct oblique coronal plane. B: Thinner acquired CT slices will equal better reconstructions. Musculoskeletal imaging requires data to be viewed in different planes. Coronal, sagittal, and axial planes are often desired. Helical thin slices in the 0.625mm-1.25mm ranges will allow for the best reconstructions and 3D images. 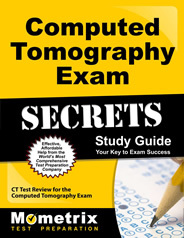 Ace the Computed Tomography test using our Computed Tomography exam study guide with practice questions. 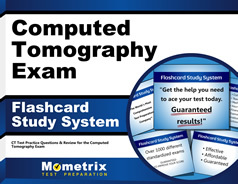 Quickly Solve Difficult Computed Tomography Test Questions with the Computed Tomography Flashcard Study System.